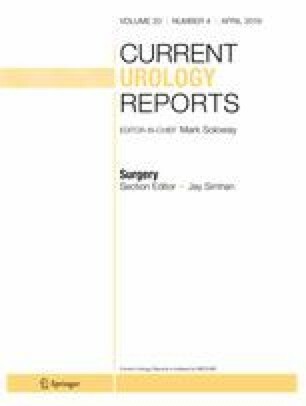 Radical prostatectomy, the preferred treatment option for organ-confined prostate cancer, is associated with a wide variety of sexual dysfunctions including erectile and orgasmic dysfunctions. Climacturia is a type of orgasmic dysfunction that has been reported to occur in 20–60% of men after radical prostatectomy. Several treatment strategies for climacturia have been evaluated and recommended including behavioral changes, use of special devices, medications, specialized therapies, and surgeries. Inflatable penile prosthesis implantation might be the treatment of choice when conservative management approaches fail to treat erectile dysfunction. In this review article, the different options and approaches for the management of climacturia during inflatable penile prosthesis surgery will be discussed. Farouk M. El-Khatib, Maxwell Towe, Judy Choi, and Faysal A. Yafi each declare no potential conflicts of interest. Gorbatiy V, et al. Outcomes of simultaneous placement of an inflatable penile prosthesis and a male urethral sling through a single perineal incision. Current Neurology and Neuroscience Reports., U.S. National Library of Medicine, Feb. 2010, www.ncbi.nlm.nih.gov/pubmed/19796057/. NIH Stem Cell Information Home Page. In Stem Cell Information [World Wide Web site]. Bethesda, MD: National Institutes of Health, U.S. Department of Health and Human Services, 2016 [cited October 30, 2018] Available at <//stemcells.nih.gov/info/basics/1.htm>.